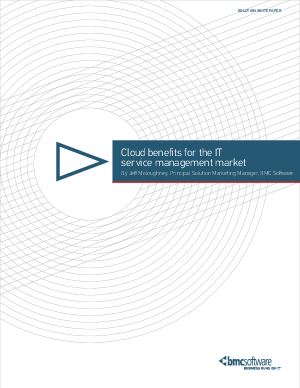 > Research Library > BMC Software > Why is the ITSM market moving to the cloud? Analysts predict that soon, half of all new IT service desk tools will be adopted as cloud-based services. While shifting to an on-demand model can be a complex decision that requires organizations to carefully assess the potential impact on business operations, a growing number of companies are clearly finding the move worthwhile. • The cost savings companies can achieve by deploying ITSM solutions via the cloud, which allows better management and optimization of consumption and costs. • Improved alignment between IT and business, as self-service, a service catalog, collaboration, and mobility help IT expose and provide its services more effectively. • The ability to integrate cloud and on-premise solutions to leverage existing systems while leveraging new innovations via the cloud. • The advantages of cloud-based adoption and upgrades, which makes the latest tools available more simply, quickly, and accurately while minimizing internal IT requirements. • The security provided through a properly built and supported cloud model. • How cloud-based solutions can reduce the risk associated with customary application deployment methods. • Advances in today’s cloud infrastructures compared with previous generations of hosted and managed services. • The agility cloud-based solutions enable for adapting to fast-changing business requirements. Download the white paper now to learn more.